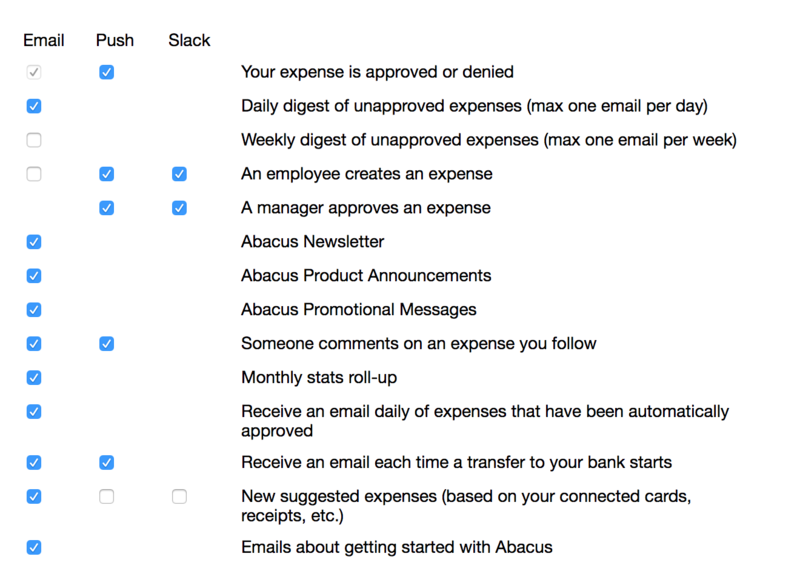 This page in your 'Account & Settings' tab gives you the option to opt-in or opt-out of notifications related to your Abacus account activity. Please note: the only notification that is not optional is an email notification when your expense is approved or denied by an admin. This is because admin approval triggers expense reimbursement, and this is how you'll know when to expect your payment (a few days after you receive this email!). Select the boxes to the left of any of the options if you’d like to opt-in to a notification. “Abacus Product Announcements”: receive updates on all new product features! “Someone comments on an expense you follow”: receive a notification when another user leaves a comment on an expense with which you’re associated. If you are a delegate of an expense, you will also receive an email when someone comments on an expense that you submitted on behalf of the primary card holder. “New suggested expenses (based on your connected cards, receipts, etc. )”: receive an update of all the new expense suggestion based on your card activity. You can learn more about suggested expenses here. “Daily digest of unapproved expenses (max one email per day): receive a reminder of those new unapproved expenses that were submitted within the last 24 hours (beginning at 6 PM EST and onward).